Developed with expandability and compatibility in mind, the Nexera XR ultra high performance liquid chromatograph enables more customers to make use of high-speed, high-resolution systems. Configure the optimal system to meet the specific analysis objective by selecting from among a wide range of highly accurate and reliable modules. 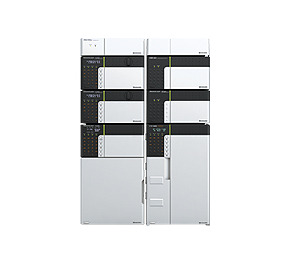 The next milestone in the evolution of liquid chromatography, the Nexera XR promises to become an indispensable tool in laboratories in a variety of fields, including pharmaceuticals, biochemistry, chemistry, environmental, and foods. Superb Functionality – Very accurarate and reproducible solvent deliveryupto 66MPa & Injection systems supporting high speed analysis. Method Compatibility– Optimized for easy method transfer from competing systems. Detectors Offering World-Leading Sensitivity – SPD-M30A Photodiode array detector and the RF-20Axs Fluorescence detector offering world-leading sensitivity.